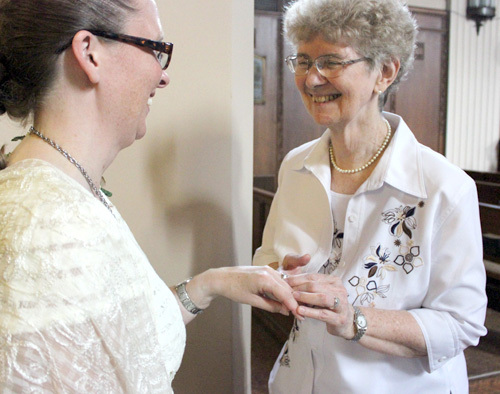 Sister Mara Rutten, left, receives her Chi-Rho ring, symbolizing her commitment to religious life with Maryknoll Sisters, from the congregation’s president, Sister Antoinette Gutzler, MM. One woman’s passion for social justice and her faith, cultivated by involvement in her local parish’s “Just Faith” program, pilgrimages to Guatemala and El Salvador, and living with Maryknoll Sisters in Cambodia, bore permanent fruit in her life on Aug. 24, when she took her First Vows, becoming the newest Maryknoll Sister of St. Dominic. Austin, Minnesota-born Mara Darleen Rutten made her vows at a Mass celebrated at Annunciation Chapel, Maryknoll Sisters Center, Ossining, New York, by Father Bill Remmel, a priest of the Society of the Divine Savior who served as pastor of Most Holy Trinity Parish, Tucson, Arizona, where Sister Mara participated in “Just Faith,” a program designed to encourage personal then social transformation through their faith, that would lead her into her life’s call. Now retired, Father Bill, who marched for civil rights while yet a young seminarian in the 1960s, “has been very instrumental in many of Mara’s journeys,” noted Sister Teruko Ito, a member of the Maryknoll Sisters Congregational Leadership Team in her opening remarks, adding that he remained active in immigration concerns, especially around border issues. A 2000 graduate of Arizona State University, Tempe, with a doctorate in philosophy, Sister Mara, who also holds a master’s degree from South Illinois Univeristy, Carbondale (1996), and a bachelor’s degree from University of Minnesota, Morris (1994), recently completed her candidacy as a Maryknoll Sister in Chicago, IL, where she attended Catholic Theological Union and completed other preparatory programs required by the congregation. Upon recitation of her vows, Sister Mara received her Chi-Rho ring, the sign of her commitment to God and Maryknoll Sisters which formalizes her entry into religious life, from Sister Antoinette Gutzler, president of Maryknoll Sisters. In the fall, she will receive her mission cross and her first official mission assignment as a Maryknoll Sister overseas. Founded in 1912, Maryknoll Sisters is the first U.S.-based congregation of women religious dedicated to foreign mission. Working primarily among the poor and marginalized in 24 countries around the world, they now number 458 members from both the US and overseas.